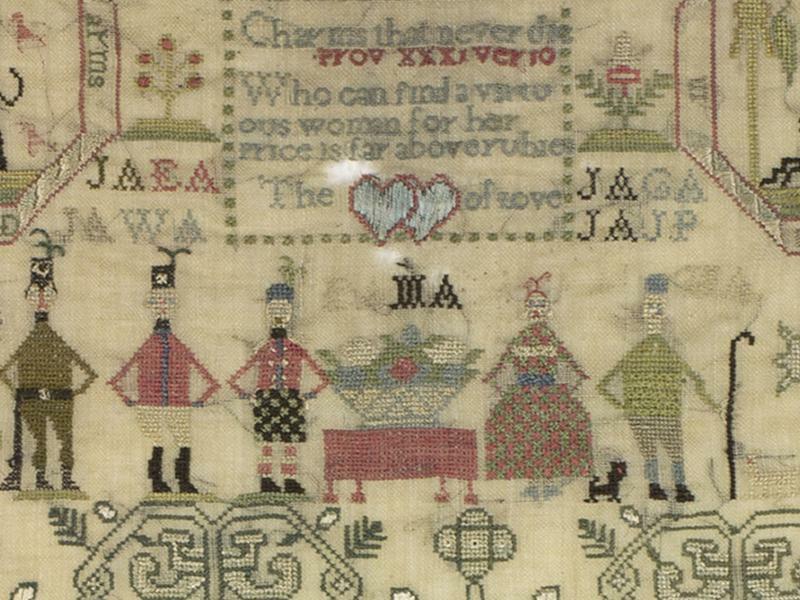 Made by girls and occasionally boys, usually as part of their education, samplers are small, pieces of needlework containing information about a person’s education, family, religion and interests. This collection of 70 samplers is a touching personal record of children’s lives, made by hand in their formative years and recording the things most dear to them. Scottish samplers are unique in that they often include the initials of extended family members and details of the place where the person lived. This has allowed collector Leslie Durst to identify the makers through genealogical research, often revealing surprising personal histories. Through the stories, they tell and the research behind them, this collection of samplers charts changes in morality, education and the industrialisation of Scottish society while also providing a fascinating insight into women’s history. Generously on loan from the Leslie B. Durst Collection. While we take every opportunity to ensure the details for Embroidered Stories: Scottish Samplers are accurate, we always advise that you contact the event organiser before setting out for the event to avoid disapointment.